Trouble is brewing in Oakland, California. 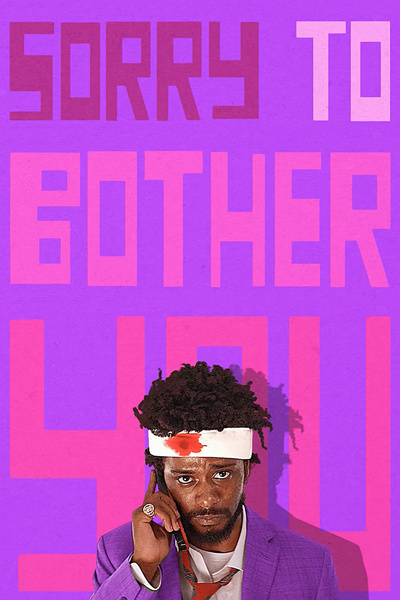 Two weeks ago Annapurna Pictures released the surreal, satirical Sorry to Bother You, shot on the streets of Oakland last summer by rapper turned filmmaker Boots Riley. The movie begins as a simple workplace comedy along the lines of Mike Judge's Office Space (1999) but ripens into a nightmare of capitalist exploitation. Like many other contemporary movies, [Sorry to Bother You] examines the divide between black and white in America; like very few other [movies], they remind us that the deeper dividing line is green. Like the recent horror phenomenon Get Out, Sorry to Bother You ponders the danger of trying to assimilate into the white world, but at heart it's a multiracial, proletarian call to arms. The young hero, Cassius (Lakeith Stanfield), is so broke he lives in his uncle's garage, a fact sprung on us when he and his straight-talking girlfriend, Detroit (Tessa Thompson), are making love and the garage door flies up, exposing them to passersby. ("Get a room!" quips one, not recognizing that they're already in one.) Desperate for a job, Cassius shows up for an interview at a telemarketing firm with a boxful of high school trophies bought at a second-hand store and a fake employee-of-the-month award. Movies about race in America are seldom in short supply, but rarely do they venture past the realm of personal prejudice into the more complicated terrain of economic racism. A notable exception last year was Dee Rees's period drama Mudbound, about a dirt-poor white family in the postwar south that can survive only by exploiting the black family down the road, but this Netflix production screened in theaters only long enough to qualify for Oscar consideration. Sorry to Bother You, in its sheer brilliance and ferocity, reverse this trend with multiracial stories about people trapped at the bottom of the ladder. In fact it is very delighted to bother us, and we need more movies like it.